As a little girl, I watched the opening ceremony of Disneyland Paris on the news with my mum. I watched with the hope that one day I would be able to meet the Disney characters and experience the Disney magic. Whilst I might not have managed to visit as a child, I was very blessed to be invited along to the park with my family as part of the Disneyland Paris 25th anniversary celebrations. Planning a trip to Disneyland Paris is exciting in itself, although with three children in different age groups I did wonder how our trip would go. Alongside the usual packing of clothes and arranging travel etc. there was something much more pressing on my mind. How would Piglet cope with the Eurostar and how would I juggle her pushchair with transfers and luggage etc. Thankfully the iCandy Strawberry SC Soho pushchair answered all my concerns and enabled us to set off on our once in a lifetime trip. Unique reversible Duel Flavour Pack – Available in a choice of three styles, Cambridge, Soho, and Tudor. The Strawberry SC enables you to change the look of your pushchair by reversing the fabrics. Whether you are wanting an uniformed look to your pushchair or a little mix and match of the two colours you have the option with these unique flavour packs. 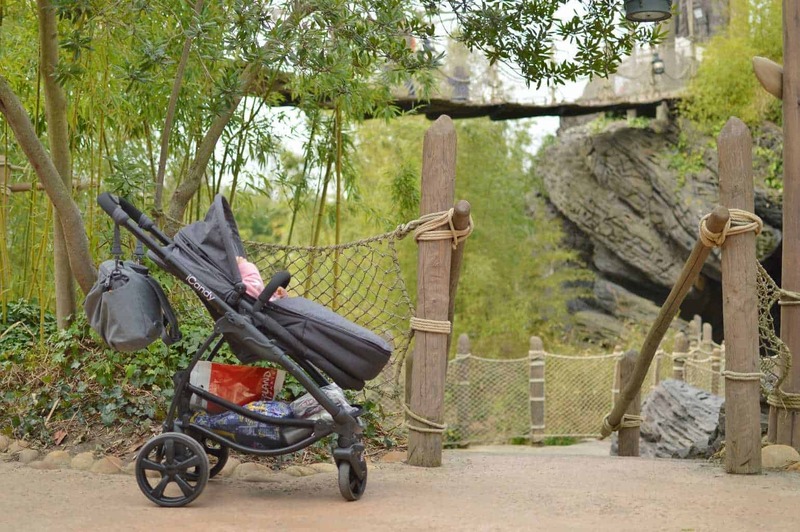 Lightweight aluminium chassis – Pushchairs can be quite heavy, which considering the weight that they hold from baby and bags you can see why. 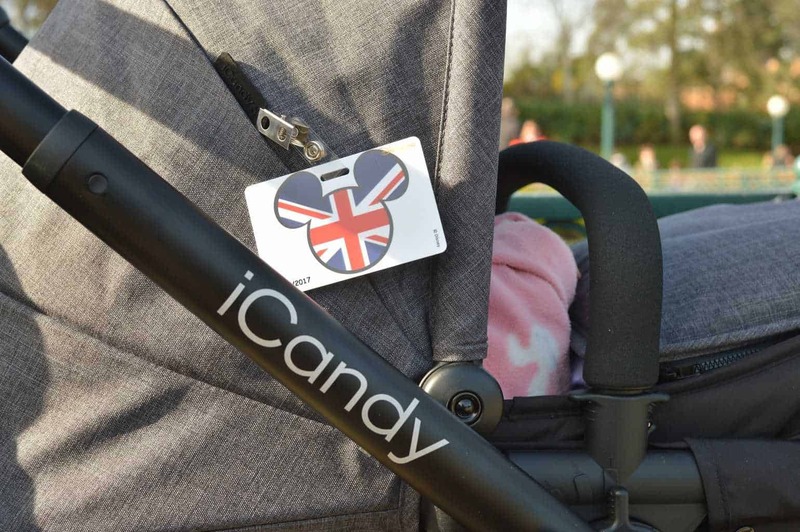 iCandy have added a lightweight aluminium chassis to the iCandy Strawberry SC Soho to enable it to be light and easy to push. As well as making it light to fold and store when it is not in use. 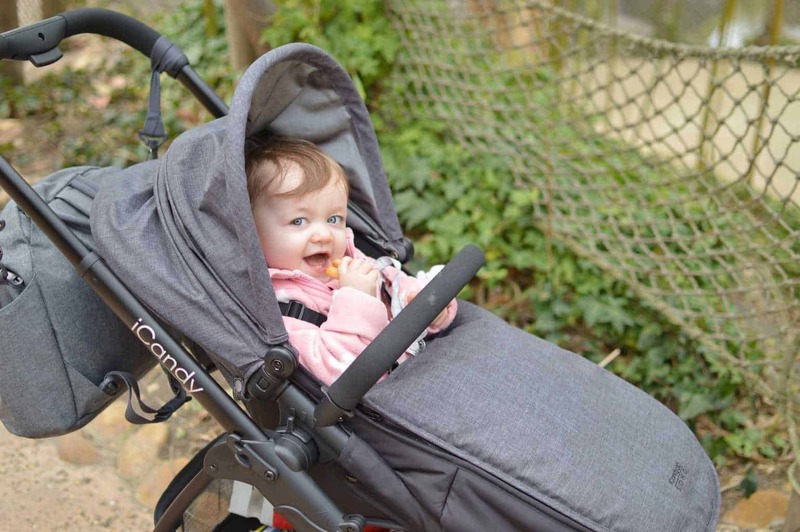 One handed fold with the parent or world facing seat unit in place – The easy to fold one-handed mechanism on the iCandy Strawberry SC Soho makes it perfect if you have a wriggly baby or toddler to contend with at the same time. It also makes it perfect for travelling as you can fold with ease for transfers or security checks. Large lie-flat carrycot – The iCandy Strawberry SC Soho is suitable from birth thanks to its large lie-flat carrycot that comes within the box as standard. Using the same frame as the seat unit however with a different base it will take up less space when it is no longer required. Whilst we were travelling to Disneyland Paris for a weekend of celebrations for their 25th anniversary. It did mean that we would be travelling via car, Eurostar and shuttle bus throughout our stay. The iCandy Strawberry SC Soho really showcases it’s versatility when it comes to travelling, with its one handed fold and memory system bring the seat unit back to the same position you had it in beforehand. Between folding for storage in the boot of the car, to navigating the Eurostar station and security checks. To storage upon the Eurostar and transfers to the hotel shuttle bus, the iCandy Strawberry SC Soho never gave us any stress. The ease of folding and putting back up was essential on our trip, none more so than on the Eurostar when Piglet would not settle and I had to retrieve it from the storage rack and assemble at the end of a carriage with her wailing in my ear. The front wheels are sprung to adapt to the roadway in front of you which was very helpful over the cobbled streets of Disneyland Paris. With the large rear wheels offering support and strength as we navigated steps, kerbs and ramps. The shopping basket offers enough space for you to carry the essentials plus some shopping, however, it does slope towards the front so if you tilt the pushchair forward you might find things can slip out. Although if you have everything in bags or ensure that loose items are kept towards the back you won’t have any issues. It’s also worth noting that as the pushchair folds the shopping basket collapses so you are only able to keep a minimum of items in there. Personally, I just left the rain covers and Piglet’s blanket in there. The shopping basket offers enough space for you to carry the essentials plus some shopping, however, it does slope towards the front so if you tilt the pushchair forward you might find things can slip out. Although if you have everything in bags or ensure that loose items are kept towards the back you won’t have any issues. It’s also worth noting that as the pushchair folds the shopping basket collapses so you are only able to keep a minimum of items in there. Personally, I just left the rain covers and Piglet’s blanket in there. The iCandy Strawberry Style Collection is available in a choice of three styles, Cambridge, Soho, and Tudor. Each offering a unique reversible Duel Flavour Pack as well as being available in either a chrome or black chassis depending on preference. The iCandy Strawberry Style Collection is priced at £730.00 which includes carrycot, seat unit, chassis, flavour pack, footmuff, rain cover and car seat adaptors.